I have tried the breakfast at this 99 Ranch location. I don't particularly appreciate the exaggerated flavors they put inside the flaky pastries and the pancakes. There is also way too much flour. Thus probably explains the cheap deal. I enjoy the the one at Champion Food located in Fountain Valley. Champion Food offers more variety and authenticity for a higher price. But nothing beats a roasted beef wrapped in pancake made on the spot by Taiwanese moms in the back kitchen, along with a bowl of hot salty soy soup. As usual...it ALL sounds good! 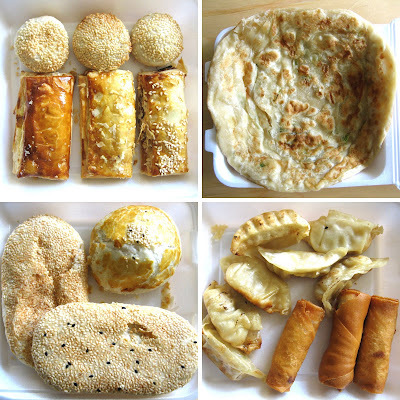 Curious if you've been to Champion Food (suggested by dumplings). I wish we had a 99 Ranch here! Hua Xing comes pretty darn close, but it needs a food court. 99 Ranch should open shop here in Michigan. There are a lot of empty spaces to fill now that the Farmer Jack chain has closed. I had no idea about Champion. I *must* check this out! I'm actually surprised to discover from your comment that Fountain Valley actually has a Chinese restaurant (I thought everything around there was Vietnamese)...double the pleasure if it also does a proper Chinese breakfast! Thanks for the tip. I haven't been to Champion, but from the sounds of it, I must go! We're lucky in Irvine to have two within two miles of each other. It's actually a bit monopolistic! the round sesame balls with the sweet mung bean inside is a vietnamese treat that i've enjoyed since i was a kid. it's called "banh cam" (literally translated as orange cake). get 'em while there hot and crispy right out of the fryer and then let 'em wrap in a paper towel to soak up some of that greasy goodness from the fryer. But...That's like the only time I can get a chance to sleep soundly without that annoying alarm clock. There are a few very authentic ethnic restaurants around this area. You probably read the OC Weekly's Best of 2007, the best Chinese restaurant is actually located in Westminster. I posted a few places for you to try in your Robata Yakitori entry. Another place I would add, if you enjoy Japanese style table-top BBQ, would be Tsuruhashi located on Brookhurst Street (next to Jurassic Zoo). Let me know what you think. Good eating! Actually it was an easy transition to make -- Stonehill was truly a go-for-broke meal, literally! That picture *did* come out nice didn't it? Pat myself on the back for that one. Sometimes I get lucky. Yum! You know, I don't think I tried that one. I will next time though. You and me both. Luckily, I got up early enough just to do this post. And I made it just in time. The breakfast ends at around noon or so (I think). Oh sure, Westminster, Garden Grove has awesome Chinese restaurants. I've eaten in most of them. I just I didn't realize that there were any in Fountain Valley. But you're right, FV's treasures are many - Tsuruhashi, Kasen, Shinsengumi, Kappo Honda to mention a few. And HAHA! *WINK* Yes, I *DID* read the OC Weekly 2007 Best Of List! You said it. If you're going to start your morning gorging on grease and carbs, why waste it on an Egg McMuffin...make it a "you tiao" with hot soy milk. That is the right address. While you are there, Wei's is right next door. Try there for lunch or dinner. Hope the food is enjoyable. I love their dim breakfast food too...especially these little sesame-crusted round pie thingy, one with salty filling and another with sweet...soooo good. They run out fast though. It's on the top of my list! They sure do. Early bird gets the sesame crusted buns! When I was in Taiwan, i looked forward to waking up to breakfast at Yung Ho Do Jiang (hot soy milk). There are 2 locations i think in Socal. They'd have delicious scallion pancakes with a fried egg on top... and for the heavy hitters, you can get a scallion pancake wrapped around a fried cruller. A scallion pancake wrapped around a fried cruller?! Now that's insane. But I bet it'll be even be greater with bacon. So I remembered your post yesterday as I drove home from spin. Waited 30+ minutes for some scallion pancake and pork-filled flaky pastry. So much better when you are exhausted and hungry beyond belief. Thanks!